During various conversations at the dmexco 2012 in cologne I realized that Social Media Risk Management already hit the boardroom but almost nobody is aware of it. So was I! The reason why I believe that social media already reached the boardroom is so simple and so complex at the same time. Who wants to spend millions for marketing campaigns some really enthusiastic and creative brains build without giving you the tools to find out how effective your campaign is. New employees are the lifeblood of every professional services firm. Attracting the right people and retaining them is key. But how do you do that? Go social! Young people leaving university and school have an incredibly huge social media competence and define themselves different than people like I did at their age. During interviews with potential candidates for our firm I had to realize that the questions I am asked are different than 10 years ago. People ask for BYOD, Smartphones, Work Life Balance Concepts, Mobility Concepts and much more. Most of the time they already used social media to inform themselves about my company. They even do not use our website, but they use facebook and twitter. So going social is not optional! It’s mandatory and therefore it’s a boardroom issue. The C-Suite usually approves this “HR stuff”. Is customer relationship management an application to plugin to you ERP system or buy a monumental application that stores all your client data. I believe we will see distributed CRM systems in the future. These are the Facebook profiles, twitter lists and Xing / linked in groups which are the data marts for future CRM systems. Right now most of the professional people, being active on social networks, maintain not only private but also business contact lists and support sales and delivery through these channels. It became more viral than most of the non social networking C-Levels believe. In the end it means that you need to rely on those people acting in social networks and facilitate sales and generate leeds. In most of the companies (especially the professional services firms) this is done unintentionally and the leaderships are overwhelmed by the “new” opportunities that arise. You might ask yourself or me why a blogger about security and risk management writes something about CRM and war for talents and what this has to do with Social Media Risk Management. As I already said it is simple but also complex. Everybody accepts that social media is in important factor in people’s life and business matters. We design campaigns for our businesses. We sometime try to enforce social media policies. But do we really think that there is a difference between private and professional social media? We think so but it’s not! People have to disclose which company they are working for or they should not write one word about this company and stay private. Uuuh good question, but I am prepared for this! I arranged this in a propper way: facebook is used privately and linkedin is used in the professional part of my life! Sounds reasonable but reality looks different. If you look at those facebook profiles you see that people disclose their company name and their position in the firm. This is the moment when a private account is not private any more. In Germany there was a law suite about where the judges came up and said that the use of a company name and maybe writing that you want to get (business contacts) is sufficient to assume you are not a privateer and that you have to behave professional. Following this argumentation the C-Levels need to be in control over what their employees do just in case a third party cannot find out ad hoc if a person is a private or a professional person when looking at posts or their profiles. C-Levels need to have an overview, who is acting as an employee of their company (even when knowing it). And last but not least it means that C-Levels have to enforce and monitor the use of policies in these open spaces. Right now I believe that boardroom members do not realize that they have to extend their control to social media or tell their people that they may not act on behalf of the firm and have to stay strictly private. But who wants this? Nobody! You would loose the viral effect of social networks! I know that this is a provocating statement but I absolutely believe what I wrote. Any comments are highly appreciated. During the last quarter of this year I had a lot of talks with CISOs and CIOs from major European companies about the impact of cyber warfare on their organizations. Most of them refused even thinking about the impact of cyber warfare, which I can absolutely understand since most of them are not working in the defense industry and thinking about warfare is nothing we like to do. Nevertheless I feel that everybody should be encouraged to think about this topic and what it means to civil organizations in general. Remember the latest press releases about Stuxnet, Duqu and Flame. What was / is the difference between cyber warfare and traditional war concepts. The main difference – and that is what makes it so important to me – is that collateral damages can never be linked directly to the armed conflict. In traditional warfare concepts you will always be able to see the collateral damage caused by a bomb. You will see it on TV. You will see it in the press. You will hear it on the radio. 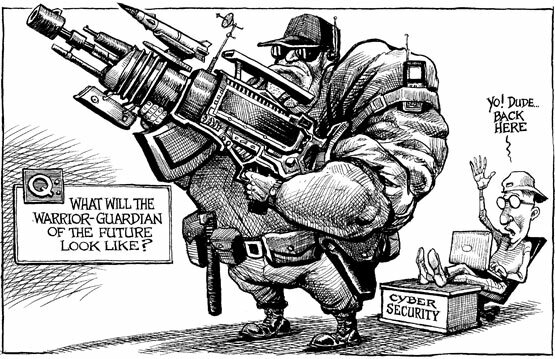 With cyber arms no one really knows who fired the gun – remember distributed attacks – and who is the target. Companies or organizations experience that they are hit by a serious attack but never know if they have been really the target. They just feel like it. But what does that mean to civil organizations and companies?The situation regarding cyber attacks is heating up. We increasingly see serious attacks which are linked to those three “governmental” viruses (Stuxnet, Doqu, Flame) or experience malicious code like the trojan code built by the German government, called the “Staatstrojaner”. After Stuxnet we saw a huge number of organizations that had security incidents linked to Stuxnet which underpins the opinion that the company might experience a collateral damage without even knowing that it is the result of a (cyber) armed conflict. One nationstate might attack the other using cyber arms turning off the light in small and medium businesses in other, not in this conflict involved, countries, disturb operations in hospitals and so forth. In the future companies need to built their own “cyber shield” to protect themselves against this kind of “advanced persistent threat”. In case of Stuxnet, Duqu and others we can learn that these intelligent pieces of code have been distributed in a way where traditional concepts like IDSes, IPSes and firewalls have been useless. Distribution was done using eMails, USB sticks, removable media and other very simple vehicles. They did not cross traditional company borders. The conclusion is: Perimeter security does not work anymore and companies need to rely on safeguards they will have to put around individual assets. We arrived at the absolute need to create asset based security mechanisms instead of big walls! This is another reason why I believe: We reached security 2.0! We need to change the way we are doing security. I absolutely know that I do not meet everyone’s opinion of this serious topic but nevertheless I encourage you to discuss it with me and discuss what you feel what security should look like in the future. Maybe I am wrong. Convince me if I am wrong! Some of you asked me to write more about Cloud Computing and issues related to this topic from the security and forensics space. I would like to share some experiences that I made during the last year mainly from (Public) cloud projects where my team and I discussed security issues with business owners but also with security experts. Sometimes I am really worried about what I see and hear. I found this comment a little bit bizarre because it shows that there is not yet a common understanding of what Cloud Computing is. According to the NIST definition it is not a hardware or software model. It is a service delivery approach for IT services. The conclusion must be: Never expect to see a hardware register or a software register that tells you “This is a Cloud”. Let me take a look at the cloud offering of provider XYZ and I’ll tell you what you need to change to be secure. you are loosing the efficiency of a cloud service that is usually designed to run without paying attention to individual needs. If you want to have your own resources you are stepping back to traditional service delivery concepts which are called “IT Outsourcing”. Let me clarify my thoughts: It is the right idea to test your suppliers and find out whether they are able to deliver the level of security you need. But it is the wrong idea to start negotiating what they need to change to meet your expectation. The only moment when I feel that this is acceptable is the moment when your requirements would be accepted as general requirements to be implemented for each cloud user. Service Quality would remain the same like the contracted while other clients will benefit from continuous improvement processes. Cost model for the service will be higher than for the “standard service” due to individualizations. I think you would not want to experience this. Just in case that you experience breach of regulations you might want to discuss this with a cloud provider because complying with regulations is mandatory and not optional and is in the interest of the provider. I know that it attracts a huge number of consulting firms that tell you to negotiate changes with cloud providers to meet your expectations. Resist! If you are talking about your own custom made cloud you can do whatever you want – but not with a public cloud service! During the last years I was really impressed what happened with the internet. Maybe you don’t share my view but I got the impression that content is becoming richer. On the other hand the curators of these rich websites want to “own” the user by simply knowing him or her and ask new users to register. There is nothing to complain about but there is no common sense on the internet about password complexity and you sometimes see really strange password rules for very simple content. What happens? You register and you try to harmonize your passwords across different platforms. In the end you are not successful and have a couple of different login credentials you cannot remember at all. One day I counted my login credentials I have to login to different websites (Facebook, twitter, linked in, yahoo, google, banking, asalavista.net and so on). I stopped counting when I reached 30 websites with around 2 different login credentials. I am using a password safe I have written on my own, but others are using open source or public domain software without really knowing what it does with your passwords. I believe it is a better idea to have one public authentication provider which is widely spread and that has a big interest in safeguarding the identity of the users. I found a good article / infographic at gigya.com showing the market reach of Facebook, twitter, linkedin, yahoo and google. It was no surprise to me that Facebook seems to have most of the users – and websites. But it was a surprised that Facebook already covers 37% of the business websites seem to use Facebook connect. I started to review most of the websites I am using and found that most of them already have a facebook connect button and some are offering multiple login buttons (Facebook and twitter or Facebook and linkedin). Think about the idea that you only login once into your Facebook account and the rest of the websites you use can use this authentication to identify you properly. I like that idea very much because it would help me to use one single and very complex password instead of dozensof passwords which are not that complex. Some people might now say that it is not a good idea to use Facebook because they are considered to misbehave in terms of privacy and I fully agree with this. But for using Facebook as identity provider you do not need to tell them everything about yourself. You do not need to share pictures, do not need to press the like it button or need to connect to other people or use Facebook apps. In the end I believe that there is hardly any other social website than Facebook that has this interest in maintaining the integrity of your digital identity. There is one simple reason: If they don’t know you, your profile has no value. The value of the entire Facebook profiles reflect the value of the Facebook brand. Remember Facebook’s IPO and you will understand what I mean. Think about it! Mabe you’ll like the idea! Security – A Misleading Concept? What is the bigger threat? Employees or hackers? The “traditional” Software Industry is loosing their key to the Internet on Next Generation Security – See how Facebook, Cloud Computing and Tablets change our lives!